This Tree guides you in bypassing social resistance so as to establish your ideas a sound and provide an account needed by a group despite their rejection. Note: The main Acceptability level in this emergent framework appears to be KL7: Significance because that must have been previously faulty, and confronting rejection and adapting requires a selfless incorporation of what is significant, like it or not. It may help to read this part first. Moving down the Tree, there is a transition from looking in depth to operating on the surface. In the spine, the two extreme Centres seem externally oriented: at the top (KL7) you are attentive to how factors fit into various perspectives, at the bottom (KL1) you depend on reliable methods. The other two Centres seem internally oriented: the upper (KL4) enables focus, the lower (KL2) enables feeling. the techniques-KL1 must be your own and activating them must be what is required in the situation. KL7B ↔ KL4B: Respect for significance-KL7B challenges whether you are genuinely seeing-KL4B; and vice versa. KL4B ↔ KL2B: Your seeing-KL4B energizes the emotions-KL2B that you experience in handling the matter; and vice versa. KL2B ↔ KL1B: Your emotions-KL2B confirm your techniques-KL1B; and vice versa. Whatever you have proposed has been based on your appreciation of the various factors and forces, and has been produced from your particular perspective. Now that your message has been rejected, you have to give more consideration to perspectives that you might usually reject. That may mean widening the scope of relevant factors and forces. Nothing that touches seriously on the issue should now be ignored. Whatever the significance attributed, it must be respected. Even if your conclusions or the account as a whole is rejected, you can also reasonably expect others to respect what you present as significant. Signs are part of communication-PH5 and the relevant phenomena may be integrated into anyone's perspective. In all cases signs require interpretation and leads to variations in opinion. Commonly, problems arise when items that appear significant to many are largely irrelevant to the issue, or when items that appear trivial to many are given high significance for the account. Because significance is inherently debatable, orthodoxy and conventions are used in society to ensure acceptability and keep excessive or inappropriate subjectivity at bay. However, you must demonstrate that your subjectivity is ruled by a dispassionate selfless attention to the variety of possible significances. Those other perspectives must have some relevance and incorporating them may increase the acceptability of your account. Respect for significance allows you to focus improvements to your presentations-KL6Y, and releases you to require greater receptivity-KL6S from your audience. The wider significance intrinsic to engaging with an increased diversity of perspectives will also challenge what you see-KL4B. Seeing in these difficult situations is more than the application of simple logic or the presentation of data that speaks for itself. It is rather using imagination, intuition, reason and evidence in order to penetrate more deeply into the particular issue of general concern and relevance to the group. When done effectively, the result is crystalline clarity and laser-like precision where it counts. However, just because an account is lucid and correct, does not mean it will be acceptable. The additional requirement here, therefore, is to see in a way that generates well-being for others. So you have to see through the resistances and be aware of how adaptations of what you offer are being received. Seeing must initially become acceptable to yourself, but you are producing the account and would not proceed if it was unacceptable. Furthermore, your well-being is likely to be enhanced by seeing clearly. The primary requirement is therefore to focus on the well-being of others. Their awareness is often blocked due to anxiety, wounds to self-esteem or feelings of helplessness. So you must see such things as well and take them into account. Within organization or communities, what you see may suggest actions that are disruptive, costly or threaten the power structure. Again, you must see these situational factors and take them into account. Delivering an unwelcome account often leads the recipient to have an urge to shoot the messenger. This is an emotional response that harms the recipient and leads to a culture where negative feedback is inhibited. Although usually associated with 'speaking truth to power', it can be a group response as well. The irrationality common in large groups and crowds interferes with a sober assessment. The messenger is then treated as a maverick, trouble-maker, or fraud. Seeing commits you to improve your presentation-KL6Y, and it gets support from the greater receptivity-KL6S that you generate. Seeing requires you to become realistic about the most relevant comparisons-KL5Y including competing views, and it gets acceptance through your appreciation of offered comparisons-KL5S, irrational though some of these may seem to be. Seeing develops credibility by your support for popular emphases-KL3S (fads and fashions), and it is encouraged if it suits your own preferences-KL3Y. In terms of scope, seeing challenges significance-KL7B, and in relation to effects, it energizes your emotions-KL2B. Emotions run high in this scenario of social exclusion and seemingly inappropriate rejection, as they do in most breakdown situations. However, in this case your emotions become the touchstone for proceeding and establishing your ideas as acceptable. Because emotions are contagious, you can use them to influence others. There is nothing subtle about emotions: either you and your ideas or findings are comforting and you feel welcomed and understood, or your account causes abhorrence and you feel rejected and devalued. Emotions are the only way to be certain you are attuning to your audience (singly or in a group) and they allow you to sense the acceptability of what you have to offer. (Intuitions, by contrast, are private and much less direct. Being subject to distortions by personal biases, they will encourage you to rationalize in a self-defensive way.) The certainty you gain from your emotions will enable others to get confidence in you and what you say. They too find certainty in their emotions, not in their thoughts. These emotions must energize the willingness to see-KL4B. They will also reaffirm your own preferences-KL3Y, and should be aligned with popular emphases-KL3S. They must confirm your reliance on relevant techniques-KL1B. Techniques used to create and spread accounts are the means by which others determine acceptability. Speech, writing, video, slides &c. may all be essential but only if appropriately produced. Scientific results, for example, are primarily judged on the methods/techniques used and the form/method of communication. Techniques, being an indication of your professionalism and expertise, must be brought into play to maximize the acceptability of your propositions. Performance is a factor because any technique may be used more or less skillfully, and applied at the right time. Others must be able to rely on the techniques as well, which means accepting their general validity and specific appropriateness. That may be difficult if they are unorthodox. Yet the challenge may have called for new techniques. The channel between techniques and emotions-KL2B should provide confirmation that you are on the right track. Techniques need to channel (and be channeled by) your support for current emphases-KL3S, and constrain (and be constrained by) your own preferences-KL3Y. You have to realize that, for whatever reason, your interchange with the group has not been effective. Unless improvements are made, your ideas will never get established. The social group's attitudes must also become more positive. As no-one else is going to address these issues, you must assert your autonomy and make changes. Above all, to increase acceptability you need to improve your own presentations because, however correct in principle, the account was unsatisfactory as communicated. However, as you are engaging with group concerns, it is also reasonable to require greater receptivity from group members. Without that, there is probably no point. But, often all you need to do is to allow the situation to evolve. Some mutual reciprocity exists between these two poles: others' receptivity tends to improve presentation, and your improvements foster greater receptivity. Reactions to your ideas primarily depend on how they were framed and presented. So you must take an honest look at your communications and consider how they can be improved. The language of may have been too dry, or too legalistic, or too abstract. The structure of the argument may have been poor. You may also be able to improve presentation through the use of diagrams, or re-writing, or simplifications, or using analogies or examples, or re-focusing on the most pressing items. Perhaps you need to offer audio or video accounts as well or link to wider concerns. Improved presentation ensures that you become committed to seeing-KL4B. It also strengthens your explanations of relevant comparisons-KL5Y; and helps you give focus to emergent significance-KL7B. Nothing can ever be communicated to someone who has their face to the wall, but you are only persisting because you believe a positive reception is possible. So you need to build on this potential, improve attitudes and increase receptivity. This may involve responding to popular expectations, reducing demands on others, offering educational support, identifying new sponsors, or targeting previously ignored groups. Sometimes, if you just have patience, events will start proving your point and an entry to acceptance opens up. Your readiness to require improved receptivity can be released by being alert to and respecting signs-KL7B. Requiring receptivity will encourage you to appreciate offered comparisons-KL5S, and enable support for your seeing-KL4B. It is difficult for any of us to accept something that we cannot understand—even though we are so often in that position. The usual way to grasp the nature of anything new or strange is to compare to it something else that is familiar (cf. Piaget's assimilation). You can convey understanding best by choosing your own comparisons to help you explain your account. Analogies or examples are always useful. However, you must expect that others will select their own comparisons and analogies, not always sensibly. Some complementarity between these two sets of comparisons helps to bridge the gulf in acceptance. You must find relevant comparisons with several or many points of similarity with the issues and your propositions. Choose what is already accepted, well-understood and (if possible) familiar and appreciated by your audience. These comparisons may be competing ideas or supportive ideas. People like explanations that take the form of analogies, illustrations, examples and stories, because this helps them feel they understand. They will almost certainly distort whatever you offer, but that need not matter. Your explanations of relevant comparisons help to ensure that seeing-KL4B becomes realistic. They need to validate your selected popular emphases-KL3S, and strengthen your presentation-KL5Y. If offered comparisons are close to your own, understanding is easier. However, those not in favor of your views or genuinely bemused will often suggest comparisons that seem to you inappropriate or even bizarre. Nevertheless, if that is how others are thinking (malice aside), then you need to take it seriously. You need to appreciate how and why they may be drawing such comparisons. By engaging on their ground, you can understand the issue better in social terms, and explain what you see in ways that others are likely to grasp. Appreciating offered comparisons encourages your requirement for receptive attitudes-KL6S, helps in getting acceptance of what you see-KL4B, and should justify insistence on your own preferences and priorities-KL3Y. Within any activity, group, field or issue, certain ideas and opinions are given most attention and importance at any moment. Anything aligned with that has group acceptability. You too have views about what are the most important aspects of your ideas and what you should emphasize. Given the diversity of relevant values and choices, priorities do not always seem particularly rational. On close inspection, emphases (i.e. priorities) both the groups and your own prove to be matters of brute assertion and intrinsically emotional. Given collective opposition, it is necessary to get on side with whatever emphases are most prevalent and get acceptability by focusing on acceptability. However, there needs to be an accommodation between your own preferences and popular priorities in your communications. The key mechanism here is charisma: through personalizing communications, stirring positive emotions, and promoting what people already view as important, resistance to you and your ideas can dissipate. See more. Note that this Centre contains the acceptability element (PH-L3) at the acceptability level (KL3) in the Tree. You are likely to perceive the group as dominated by conventional wisdom, fashions and fads, or habitual views. However, if this is where others put their attention, time and money, opposition is futile. Even if some views run counter to your message, you have to take notice. You must find a way to align yourself with emphases in current opinions that you can share and actively promote. If you are in tune, as fashionable but unfavorable ideas fade, you can seize your opportunity with the new emphasis. Supporting popular emphases provides credibility for your seeing-KL4B, and validates your relevant comparisons-KL5Y. It should align with your emotions-KL2B, and channel the activation of techniques-KL1B. Your account has numerous dimensions, features and/or recommendations about which you feel differently. You may need to compromise or tone down some aspects to make your message more acceptable. However, what you judge as most important must remain. This is a matter of your personal preference, however much you rationalize it. Probably wider personal priorities are playing a part here because some self-protection is mandatory. Such priorities might relate to your future plans, to other time commitments, to ensuring your own safety, to maintaining self-respect, to controlling expenditures. Insisting on your own preferences provides you with encouragement to keep seeing-KL4B. Your insistence also reaffirms your emotions-KL2B, and constrains the techniques-KL1B that you activate. 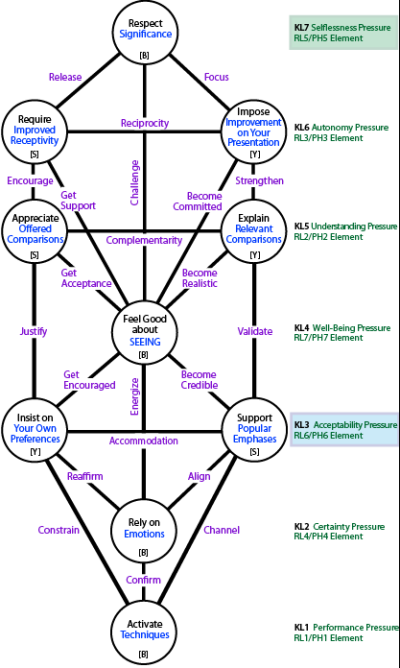 Continue to Reducing Intra-Group Conflicts: the Tree of PH-L4s from PH2-Inquiry that helps you promote social harmony. Previously amended: 13-May-2014. Last updated: 24-Jan-2015.